Weddings are a wonderful celebration, full of joy and fun. When planning your own wedding it is always a nice idea to introduce ideas that really reflect you as a couple. When it comes to wedding entertainment, you don’t need to stick to traditional options. Have as much fun as you want with our top 7 exciting entertainment ideas including some of the most popular variety acts available to book for a memorable wedding. For entertainment your guests won’t be expecting, why not hire comedy waiters to surprise your guests during your wedding breakfast? Comedy waiters work alongside genuine waiters and add in improvisation and increasingly clumsy behaviour. From dropping plates, arguing with guests and nibbling at leftovers, your guests suspicions will be raised until they finally work out that the whole experience was a set up. This type of entertainment isn’t for everyone but it is certainly entertaining! If you would prefer to keep your wedding breakfast to a sophisticated affair, but still like the idea of including comedy in your celebrations, why not hire a comedy singer who will perform funny songs during your evening reception? Comedy singers are very witty and are sure to get everyone laughing with their performance. Add a touch of magic to your wedding reception by hiring an illusionist. An illusionist will perform an elaborate display to your guests, usually with an assistant. Your guests will be amazed when they watch illusions, escapology and mentalism performed on stage and have plenty to talk about once the show is over. Another exciting form of entertainment, perfect for evening receptions is the flamenco dancer. Flamenco dancers put on a vibrant colourful performance and dance to live Spanish guitar music. Your guests will be captivated and not expect such a performance but are sure to remember it for years to come. Belly Dancers are traditional across Egyptian weddings but are becoming increasingly popular in Western weddings too. Belly dancers are professionally trained to enchant and perform in exquisite costumes. Belly dancers usually perform to Arabic and Eastern music and sometimes get guests involved too. Again, this type of entertainment is not for everyone, but it is unusual and very glamourous. Hiring a fire performer for your wedding evening reception will certainly add a visual element to your big day. 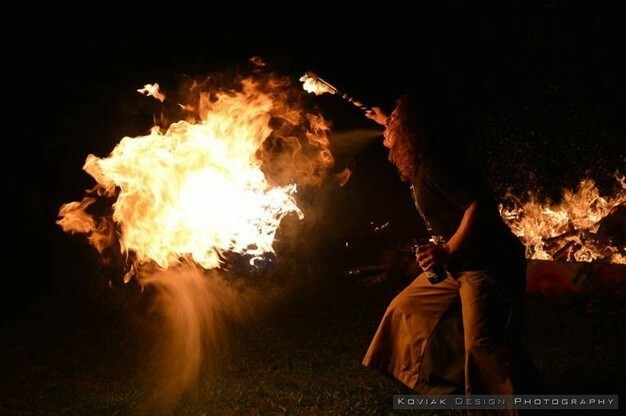 Fire performers juggle, eat fire and perform other jaw dropping stunts with fire. This form of entertainment is extremely exciting and most suited to when the sun sets for the ultimate impact. If you like the idea of exciting entertainment for your wedding reception but you don’t want to steer too far from the norm, why not turn your reception into a fun and exciting barn dance or Ceilidh? Speciality barn dance and Ceilidh bands can be hired to perform while your guests dance the night away. We hope you have enjoyed reading our top 7 suggestions for exciting wedding entertainment and that we have inspired you for your own special day. If you decide to give one of these suggestions a try, you and your guests will be sure to enjoy a very memorable occasion. Booking is really easy when you use our website – simply find the entertainer you are interested in and get in touch with them directly using the “Contact Direct / Request Quote” button. This entry was posted in Wedding Entertainment Ideas!, Which Type of Entertainment Should you Hire?. Bookmark the permalink.